IT-S BEEN JUST A FEW weeks since I last stopped by the home going up at the end of Watroo Point on Daniel Island, but, in that short amount of time, a great deal of progress has been made. If anything, it is more impressive than before. Ben Henrich, the builder, guides me through the house, showing me the highlights. Once again, he is so excited that I can-t help but feel the same way. "The windows weren-t in when you were here before," Ben tells me. "These are Marvin impact and energy rated windows. We could have put in less expensive windows, but I didn-t want to settle. These windows will withstand anything." 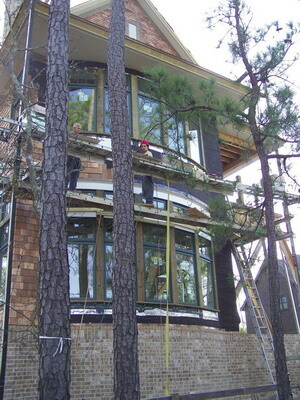 And the windows are spectacular - a serpentine pattern of floor-to-ceiling glass panels that maximizes the marsh views. Then we-re on to the magnificent fireplace that is the centerpiece of the living room. This is one of the few changes to the original plan. Because Henrich didn-t want the view from the kitchen to be totally obscured by the fireplace, the opening was raised, providing expansive views from the kitchen. Speaking of the kitchen, Henrich tells me about the William Ohs designed cabinets, which were created and built just for this house. "These cabinets will actually be installed by the company," he says. "They don-t allow other contractors to do the work. The people from Ohs will drive here from Denver with the cabinets to perform the installation." Henrich goes on to talk about the floors, which will be Carlisle Wide Plank. "The planks are up to 13 inches wide and will give a rustic look to the house," he explains. Also impressive are details such as tankless hot water heaters and geothermal heating. Even the ceilings are special-coffered ceilings downstairs and vaulted beadboard ceilings upstairs. All this attention to detail has made for a complicated project for Cook-Bonner Construction. The dimensions of the lot alone are challenging, according to George Bonner, who adds that the architect has done a great job designing the house to fit the lot while maintaining a good flow throughout. "The layout is very different because there are so many angles, curves and ups and downs," Bonner says. "And we have to work in phases because of the site limitations. It-s difficult to stage materials and accommodate the many people working there." Confronting the challenges is well worth the effort, Bonner agrees, because "It is just going to be a fascinating house."